After a long day at work why not take the opportunity to wind down with a glass of wine and immerse yourself in beautiful and powerful music by Beethoven and Mozart, played by the University of Warwick's internationally renowned resident musicians, the Coull Quartet. The Coull are giving a short concert in the Atrium of University House on Thursday 21 September starting at 18:00 with drinks being served from 17:30. The short programme will include Mozart's 'Hoffmeister' Quartet K499 in D major and Beethoven's 'Razumovsky' Quartet Op59 No.3 in C major. Spaces are limited so please RSVP to internalcomms@warwick.ac.uk or ext. 22876 giving your name and the number of places you would like to reserve. Quartet-in-Residence at the University of Warwick since 1977, the Coull Quartet is actively involved in the University's flourishing musical life, teaching and coaching instrumentalists, chamber groups and the student orchestras, as well as giving recitals at its renowned Arts Centre. One of Britain's most respected and longest-established ensembles, the Coull Quartet performs throughout the UK, the USA and Western Europe, has toured India, the Far East, Middle East, South America and Australia, and has given many radio and television broadcasts at home and abroad. 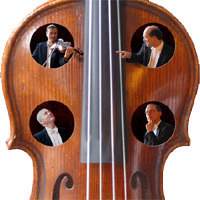 The Coull Quartet celebrated its 30th anniversary in 2004 and has an impressive list of commissions to its name, including works by Nicholas Maw, Robert Simpson, David Matthews and Edward Cowie. The Coull Quartet has also made many critically acclaimed recordings, including the complete Schubert Quartets, the complete Mendelssohn Quartets (the recommended choice of BBC Radio 3's Record Review) and a recording of quartets by Walton, Elgar and Bridge which was voted 'Record of the Year' by BBC Music Magazine. Their recording of Simpson's Quartets Nos. 10 and 11 was given a similar accolade by the critic of the New York Times. They have recently begun a series of recordings for Somm Records, which will include both standard and less well-known repertoire. The first two recordings are of works by Mozart and a third disc of works by Nicholas Maw and Benjamin Britten has just been recorded.